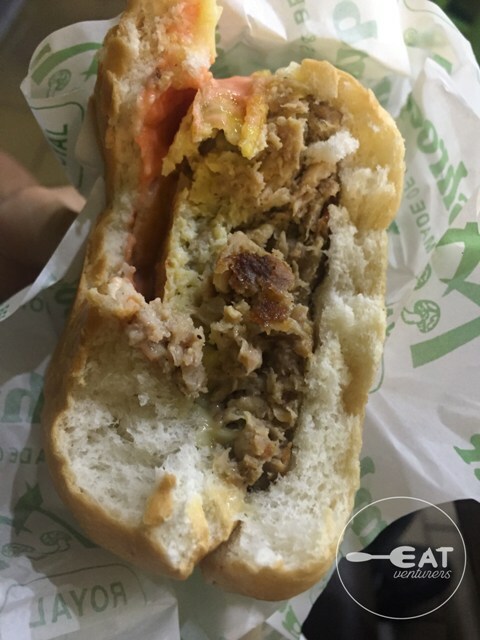 When foodtripping in Tagaytay, gone are the days when people only visit for bulalo or their breakfast places and coffee shops, tourists or locals also visit a famous fastfood chain located at the heart of this city, Mushroomburger. According to its website, the famous 'shroom chain owners started its humble beginnings by mastering the art of growing mushroom in Caloocan City during the '70s. 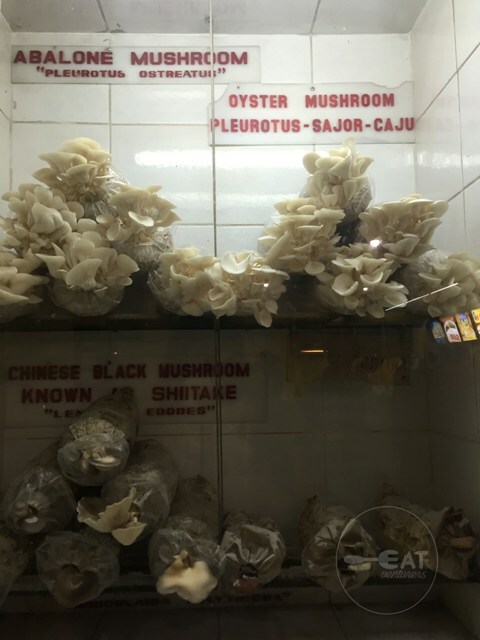 They finally began marketing them in Tagaytay City in 1978 and later on decided to build a chain after its prosperous market of various kinds of mushrooms such as abalone, oyster, wooden ear and shiitake. 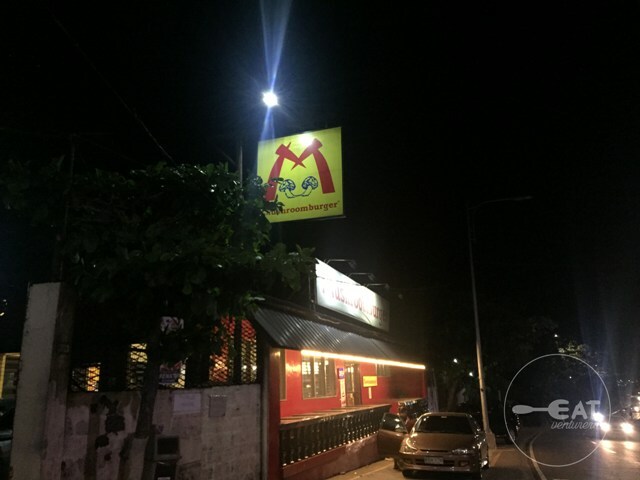 The Eatventurers tried its very first branch in Tagaytay during their trip. Just a jeepney ride or 10 to 15 minutes ride away from Sky Ranch. 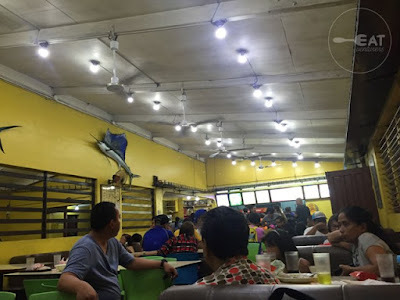 It used to have three branches, one in West Avenue and another in Katipunan, Quezon City, but the latter closed just recently. During our visit at almost 7 o'clock in the evening, the place was already jampacked of local tourists eating and getting dinner. Good thing, they have a spacious dining area with several tables and chairs and have a separate room also open to customers. Based on its menu, food price ranges from P72 to P175 with meals you can upgrade or have add-ons, while for drinks and desserts they offer sweet treats for as low as P33 to P37. Aside from these, they have party meals packed in bilao which costs P285 to P675. If you're wondering if they strictly offer burger, you are wrong. 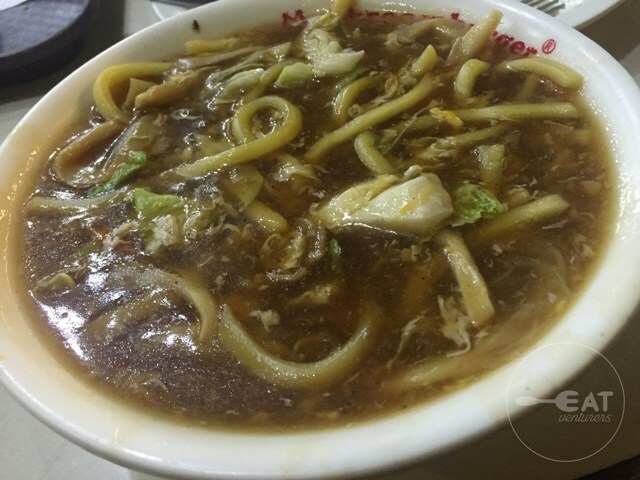 They have various dishes incorporated with mushroom as ingredient which include fastfood meals such as chicken, spaghetti and even local dishes like pancit canton, lomi, sisig, tapa and longganisa, among others. Upon ordering, you will have to wait for your orders at the counter and the rest is self-service. 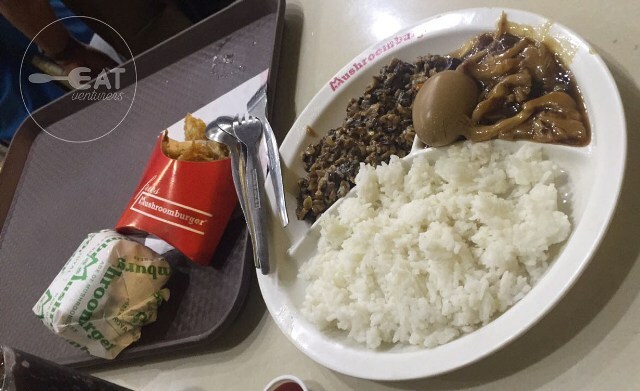 Miguel ordered Mushroom Melt with large mushroom fries while Rosette ordered No-meat Mushroom Sisig. No-meat mushroom Sisig costs P105 for rice meal and P125 with Hong Kong rice meal is a good alternative for vegetarians. 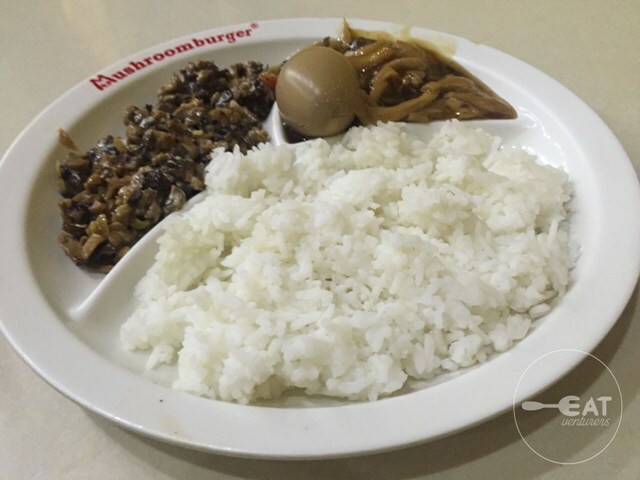 For HK rice meal, it is served with egg, and veggies with oyster sauce on the side. It initially look like "bopis" but it's just pure chopped mushrooms that taste good but cannot be compared to regular sisig. Since we came all the way from Manila, we decided to order another dish. Rosette was craving for mushroom soup but we decided to opt for lomi instead because it is being served in a bigger portion. One bowl is actually good for three people for only P103. It's not as tasty as the regular lomi, somehow tasteless and a little bit bitter that it needs more seasoning or calamansi. Maybe that's the effect of mushroom. Big servings, we tell you. Mushroom Melt - Mushroomburger isn't called "mushroomburger" for nothing. 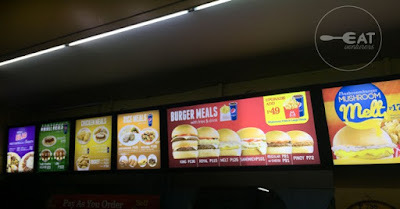 Their melted cheese burger speaks for the name of the Tagaytay-famed fast food chain. Juicy, new to your tastebuds and more importantly affordable. At P175, you can avail Melted Cheese burger coupled with large mushroom fries and drinks of your choice. Best served with sweet catsup. Newsflash though, it's not as different or as life changing as your regular burger for it still has beef, but it would not hurt to try because it's still reassuringly yummy. 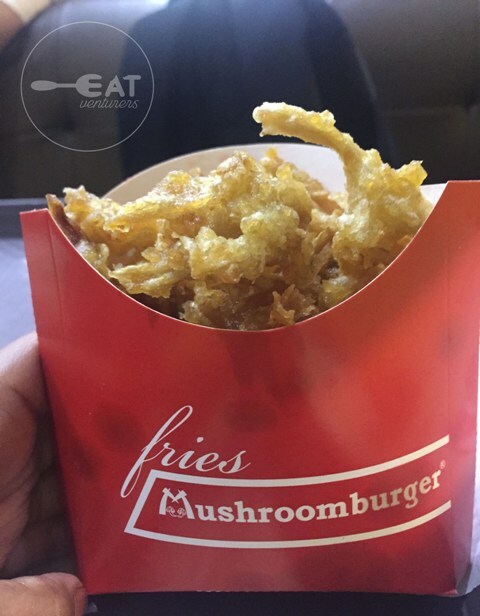 Mushroom fries- If you are to eat at Mushroomburger, this is something you should not miss because where else can you find a fries made of mushroom? TRY IT. It's pretty much like onion rings and regular fries except that it's deep fried mushroom. You wouldn't even feel it's mushroom. Not as fast as other fastfood chains. It took us about 20 minutes before we can claim our orders. The larger group of customers got their orders ahead of us but given that it was jampacked during our visit, we'll give them the benefit of the doubt.